In the early years of the craft beer revolution, pumpkin beer was a novelty — something that stood out from usual the assortment of pale ales and stouts. Nowadays, it’s a standard seasonal release. And that release date keeps coming earlier and earlier, with breweries and brewpubs racing each other for the earliest date. One brewery even joked that this year’s August release was for the 2014 edition. At this rate, it’s bound to become the first year-round seasonal beer. I live in the northeast, where pumpkin beer is a harbinger of crisp fall weather and spectacular foliage. I’m compelled to order one whenever I have the opportunity. Unfortunately, I’m often disappointed. Many are watery with unassertive spice profiles, or don’t use any pumpkin. But that’s not a problem. I’m a homebrewer. If I want something done right, I can do it myself. My goal is to brew liquid pumpkin pie. Using an amber ale base style, I start with Maris Otter and Munich malt for a strong bready backbone. Belgian specialty malts like Caramunich and aromatic add character and complexity. Dark brown sugar adds more flavor, color, and fermentables. The recipe’s grain bill is adaptable to extract brewing, and is every bit as robust as the all-grain version. I used to make my pumpkin beer stronger, like a desert beverage. But it’s so tasty; I find myself wanting more than one. So I to rein in the original gravity at about 1.065 to keep it sessionable. 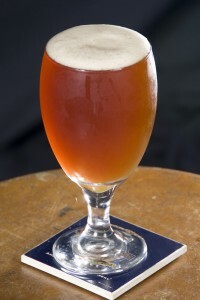 I hate to state the obvious: pumpkin beer needs pumpkin. 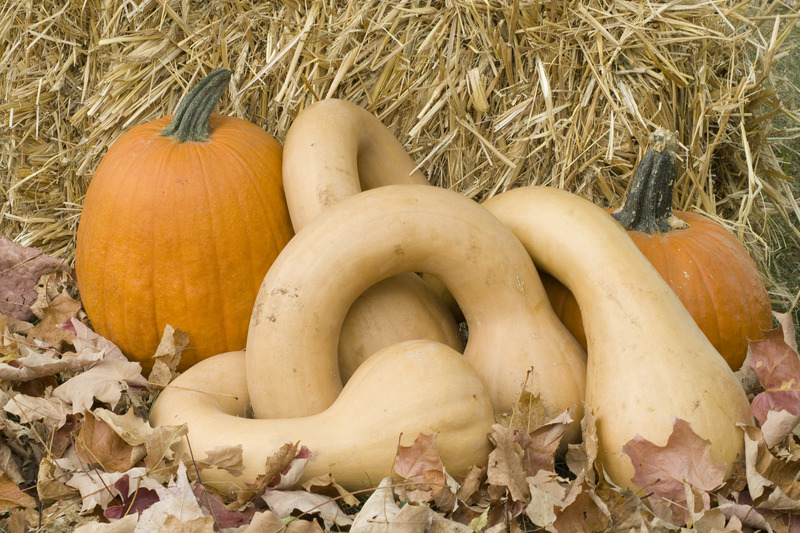 Don’t use the jack o’ lantern pumpkins, use crook neck squash. It looks like a cashew on steroids. Cut the pumpkin into large pieces, sprinkle them liberally with brown sugar, and roast in the oven at 350 °F (180 °C) until tender. Then carve the flesh from the skin and cube it. Most recipes use the pumpkin in the mash, with a ton of rice hulls and a prayer. I put my pumpkin in the boil. I know. It’s heresy. The common wisdom is that the beer will be cloudy and unstable from the starch. But this is an uncommon beer. For whatever reasons, this isn’t a problem in practice. The brew will be crystal clear and stable. I enjoy the pumpkin beer I brew in October well into June. I used just toss the pumpkin into a boil kettle with a false bottom to keep the ball valve from clogging, but it still made an awful mess. My wife suggested putting the pumpkin into a large fine mesh bag, like one would use for fruit. Problem solved. Canned pumpkin will work as a substitute. It’s already cooked, but it can be lightly roasted in the oven with some brown sugar until carmelization occurs. White Labs WLP002 (English Ale) is my choice of yeast. It leaves a hint of sweetness and flocculates nicely for a dazzlingly clear beer. There’s some leeway with fermentation temperature, anything between 65 °F to 70 °F (18–21 °C) will work. Fermentation will be fast and furious, finishing in only a few days. But wait a week or so to be sure. The hop choice isn’t important. Any neutral bittering hop that balances the malt sweetness will suffice. Higher alpha selections like Magnum and Galena are good choices because the smaller amount needed will keep the vegetal matter to a minimum. No late hops are added because they’d compete with the real stars of the show: the spices. I’ve worked out the spice regimen over several years, tailoring it to my taste. Those who don’t like my spice choices are free to experiment. Regardless, use the best quality spices available. I start with Saigon cinnamon. Its sweet, vibrant flavor melds perfectly with the malt. Ginger is next. I use freshly grated. Less is needed than if using the dry version. Lastly, I grate in some nutmeg. A touch of high quality vanilla in the secondary blends the spices and adds a creamy texture. Spice cautiously. It’s easy to add more. The first additions are at the end of the boil. When fermentation slows, rack to a secondary fermenter to remove any pumpkin sediment, taste, and spice accordingly. For these late additions, dissolve the spices in a few ounces of hot water before adding. Remember that the spice profile will change as the beer ages. I spice assertively, knowing that the flavors will mellow to the levels I want after about a month. As the beer ages further, the profile will continue to change, maturing like a wine. The only exception is the vanilla. That flavor is locked in, so use it judiciously. Once satisfied with the spice additions, all that’s left to do is bottle or keg — and enjoy, repeatedly. See Mark’s pumpkin ale recipe for more information. What commercial version would you equate this recipe to? How chewy is the mouthfeel. I thought the point of putting the pumpkin in the mash was to extract it’s starches. However I know that when this is done, there is no detectable pumpkin flavor. So let me ask… Does putting the pumpkin into the boil bring out a more pumpkiny flavor? Just kegged my first pumpkin beer. It was still cloudy at the end of the secondary ferment so I borrowed a trick from wine-making……. added pectinase (pectic enzyme). Pumpkin is chock full of pectin and pectin holds solids in suspension. Added 10 drops of liquid pectinase last night and tonight it was clear as a bell with about an inch of solids on the bottom of the carboy. Hope it’s good! Thanks for the info… great advice.